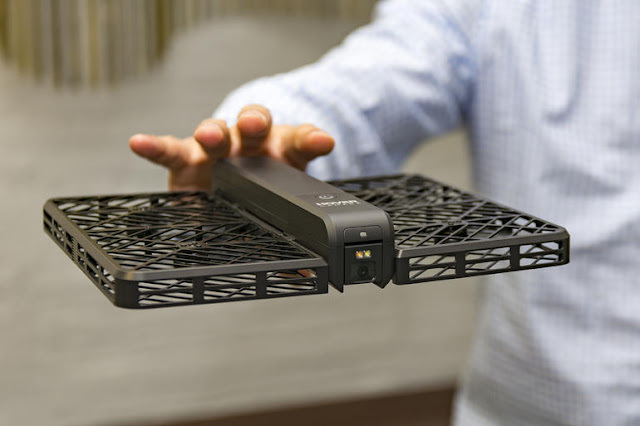 Drones are becoming the commodity item in the last half of the 2010's, and now there's one that makes these aerial devices even more desirable to an end user: the small and foldable Hover Camera - that can automatically track people and objects. Sure there are drones for all shapes and sizes (and prices). But most of them aren't really that handy to carry around, requiring bulky backpacks, and special care not to break any propellers. Not so with this Hover Camera. The Hover Camera is a compact drone that can be folded into a book like format, and has its propellers completely surrounded by a protective carbon fiber case. It can record up to 4K video, and it has a powerful CPU (that is cooled by the air from the propellers.) The camera also has a mini-gimbal that provides stabilized recordings, and it can also track subjects automatically, requiring no professional drone pilot to achieve it. Also curious, the Hover Camera won't be using a crowdfunding site to become a comercial product. It will be made the old-fashioned way, and be put on sale only when it's done. That should happen by August, with a price of around $600. If you're interested, you can join up and request to be a beta-tester.